A colour slide of an aerial view of Whitby looking south. 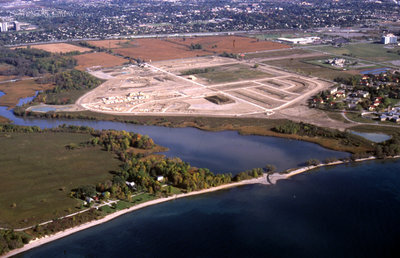 In the centre of the photograph is the subdivision of Whitby Shores under construction. On the right side of the photograph is Ontario Shores Centre for Mental Health Sciences. In the foreground of the photograph is Lake Ontario. Aerial View of Whitby looking South, October 7, 1998, Richard Woolger. Whitby Archives A2014_014_005.